Today, for the first time in I couldn’t tell you how long, I left my house on a Saturday. Not to go somewhere or do errands or meet someone, I left my house with my ipad and journal to go sit at a coffee shop.And I was walking in the crisp, bright, winter air I looked at the downtown skyline which has become one of my favorite views- the mountains created a back drop to the herald sign, the red museum creating a stark contrast to the blue skies. Beauty in unexpected things. It reminds me of the beauty I found in Beira, Mozambique when we had to live in the city, or the beauty of the hustle and bustle of Bangkok. Finding beauty where your feet are. Growing up,my mother’s kitchen table always had Diet Coke, at least two remotes, some form of baked good and a hodgepodge of people. The doorway of our house was crossed by humans from lots of different walks of life, ages, journeys, people in the highs and lows. It’s part of the reason why I love inviting people over and meeting people where they are at. And I think it’s why I’ve always had and been comfortable in so many different groups of people. And why I am friends with a handful of people I’ve never actual met or have only known in person one or two weeks of my life. 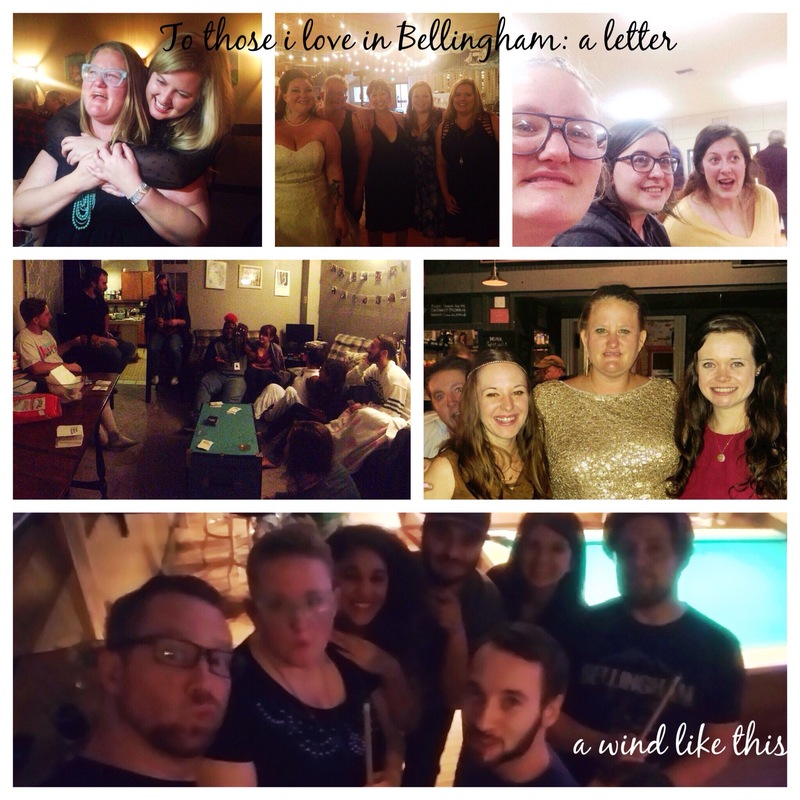 But I believe I can say, beyond a shadow of a doubt, that you people, those I interact with on AT LEAST a weekly basis (if not daily) here in Bellingham are the most eclectic group of humans I’ve ever encountered. And man do I love you guys. And what’s funny is that I only interact with people here that are somehow connected to one of two places: The Y or A Life. My job and my church. But what a difference it’s made. The realization I had, the thing that finally hit my heart even though the knowledge has always been there, even though it’s a truth I love to remind people of, is that knowing all of you guys, specifically in this time in my life has caused me to know more of who I am then I ever thought possible. As I said, that tidbit was in my brain, the knowledge was there. Every conversation, interactions, the laughter, the tears, all those things stored together from people have been building blocks. It’s normally not something you truly realize until you are in a high emotions situation or a situation when you are around the same people day in and out where you begin to realize bits and pieces of yourself through them. You guys have been the most wonderful piece of self discovery. Because of everyone of you I’ve not only learned more of who I am, but more of who I want to be. And I believe every time I said I wanted to run it was because all of the things I was learning and feeling and desiring were becoming far too big for the life I had been living. All the ugly surfacing were dreams and desires and hopes I had buried long ago for fear of getting hurt. Before I moved here, I would, here and there, struggle with comparison and jealousy and loneliness and lack of identity, but the last year and a half all of those things have been stirred up, multiplied and fleshed out. And that has made me want to run. Everyone of you has kept my feet planted. Because I think, I believe, I know, that there are aspects in each and everyone of you that have caused me to want more, desire more, be more. That all became too big for my heart. You guys believed in me when I didn’t think I had anything to believe in. You chose more for me when I thought I was done with more. And it causes me to think of the people I had and still very much have before here, that encouraged me to get to this place, and the people before that and that. My life journey is filled with people. Beautiful, lovely, whimsical human beings from all places and countries and backgrounds. My desire in life is to be so wholly myself that it causes others to see more of who they are. And Bellingham has been a shocking, surprising, not always welcome huge step towards this very thing. Bellingfamily and Yfamily and all those connected to the two, I need you to know that I’ve never wanted to run from you. I’ve wanted to run from the life that was getting too beautifully big for the box I had. I wanted to run from the emotions that all of that was bringing up that I’d gotten supremely used to ignoring. Find people. Find multiple groups of people. Find people you agree with. Find people you disagree with. People who live life differently then you and those who walk the same road. Find people who worship the same and find those who believe differently. Sit across tables from them, break bread them, clink glasses with them. Laugh with them. And learn, even if it’s just for a night. Learn who they are, where they come from, how they make a sandwich. And when you wake up, I guarantee you will have found more of yourself. In the similarities, the differences and the universal truths. Let’s choose, daily, to bring the people around us to more of who they are. I just wrote four or five lines on how this statement wasn’t true. But I deleted them because I realized that this year did indeed have all the things. Meaning there was space for them. There just wasn’t space for anything else. I wrote in part one how I cried a lot this year. Painful, gut-wrenching, heartbreaking sobs. But, because most things in my life in one way or another relate back to tiny humans as this last week has been me in a state of exhaustion I began thinking about this fact that’s always in the back of brain especially in regards to the tiny humans that take a little bit more of my teacher Meg voice. For every negative that is spoken over a human (no!, that wasn’t a good choice, redirecting, or even stepping into help with a direction) you need 5 positives to balance it out. And actually, at the end of the day most need ten. We have an average of about 20,000 interactions a day. And how many of those are positive or negative. This is where I feel we get hit. This is where I feel I get hit. Partly because if I’m being honest , I am not the first to speak positive things to myself. Not neccesarily that I speak negatively to myself, but I don’t counteract the outside world. I also am not the greatest at receiving the words or big acts from people. 2016 was a full fledge attack on my identity. It was a year that told me time after time after time that I wasn’t enough, or good enough, or first choice, or wanted. It was a year that told me to just give up. It was year that tried to strip the joy away from things in my life that are good and lovely. But you know what? There is something, deep ingrained in me, that tells me that the lovely and good are still there. And for as much as I will be the first to say that I battled things in this year that I thought were long passed-insecurities, and ghosts and anxiety I will also say but. Because the people in my life had so many lovely, celebratory things happen in their life and they invited me along for the ride. Because the people in my life had hard, hard times and they invited me to grieve with them. Because the people in my life put their arm around my shoulder when I had no words for what I needed. Because for as many times as I told the people in my life that they weren’t crazy and it was ok they said the same thing back. If this year has taught me anything or really reiterated a lesson I already knew, it’s that I do better, I’m more myself because of the people around me. And on the days when the lives of the people around me cause me to see what I’m lacking, I have to choose to remember that without them I’d be lacking and vice versa. So yes, I have absolutely no problem saying this year will not go down as a favorite. But I will say that I learned to celebrate small things and REALLY celebrate the joyous beautiful things. I will say I learned to choose my battles. And to stand my ground. I will say I fell more deeply in love with the people in my life. Because without them, what’s really the point? So 2016, I bid you a gigantic peace out. I thank you for the tears from laughter, for the margaritas on Tuesday, the champagne on Sundays, for a dozen cheesecakes and tables teeming with people. But like, please let the door hit you on the way out.